LVbet Sportsbetting is one of the youngest bookmakers in UK and offers its huge repertoire of sports and live betting only since 2017. This has no effect on the range of sports betting offers, live betting offers or the many betting options. On the contrary, the LVbet Sport is convincing in its entirety. In addition, it presents its offer on an innovative and functional platform. This is convincing with an good overview, which is also necessary in the immense selection of sports betting. From more than 50 countries sports events are offered. Betting enthusiasts players have access to over 60 different sports. The LVbet has everything to become one of the very big bookmakers! The player’s favorite child are without a doubt the live betting. Here LVbet is very convincing, because they have found the perfect solution to transport the charm of live betting to the players. Players can choose betting offers from two different perspectives. One from the single view and another one from the conference view. In fact you never lose the overview, even if you bet at several events at the same time. Really great is in the single view the representation of the playing field. It is practically live and you can follow the events very well. 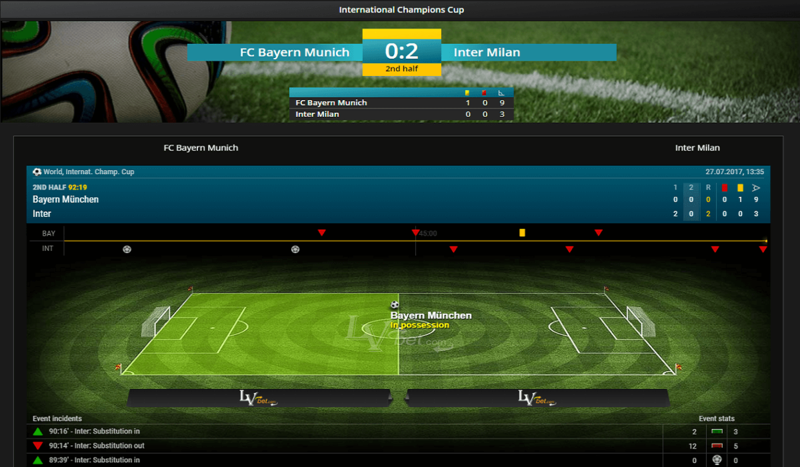 Additional streaming of sporting events is not necessary anymore – every second you get score updates delivered. Live betting fans will have their pleasure with this feature! Live Scores! Check out! Taking the range of sports as a benchmark, the LVbet sports is as least competitive as most of the renowned UK bookmaker. Of course you should not forget that we are still talking about a relatively young provider in the highly competitive industry. But the fans will be satisfied. More than 60 sports are already available and still more are added. Soccer, e.g. with the Champions League, is of course high on the popularity scale, but also Formula 1, boxing, ice hockey and American sports are available. Particularly impressive are the up to 150 betting options which are partly offered. Where the LVbet sports betting is also quite strong are the eSports-Betting. Whether you want to bet on Counter-Strike, League of Legends, Overwatch, or even on Starcraft – there are the popular virtual bets in a similar selection as football betting. To compare the betting odds among the bookmakers, of course, is not easy. For the regular players these are of course already important. In the LVbet sportsbetting you can see a good trend. Especially for football betting, the provider has a good odds ratio of an average of 95%. Players should also pay attention to sports events where LVbet is the main sponsor. Also, there are very good bets that are better than the direct competitors. On the homepage these events are always announced immediately. So players do not miss anything and can benefit from it. For the occasional sports betting fans however the good functionality should be in the foreground, because this makes the betting really fun here. For sports enthusiasts who like to give their sports bets on the road, there is a good and also less good news. The website is very suitable for playing and betting. However, a special mobile app has been waived. This has the disadvantage, that on smart phones with a relatively small display everything is somewhat small. For devices with larger displays or tablets, this is not a problem. But all this has a great advantage. The offer of bets, all functions, bonus offers or even the live support can also be used on the way. The desktop version is practically simple to the size of the display, which guarantees unlimited use of all functions. The minimum bets for sports and live betting are £1 per bet. This is a good value for single betting. In system betting or combination betting, of course, it becomes correspondingly more expensive. Actually the LVbet could also offer smaller minimum bets, as these option bets are very gladly used by many of the players. The maximum profit per bet is £100.000. This means that professional players and high rollers has unlimited possibilities. All in all, the limits for betting are comparable to those of the other big bookmakers. LVbet Sport and LVbet Casino offer their customers a wide range of renowned payment providers. There are all sorts of options ranging from credit cards, e-wallets, bank transfers to debit cards. Visa and Master cards are available. The E-Wallets are covered by Neteller, Skrill and Paymenticon. Paypal is not yet available. For deposits, players can also use Paysafe. Profit withdrawals are possible from £20 . Here, the player will not be charged – all transfers are without fees. Neteller and Skrill are best suited for quick payouts. The support processes these quickly and so players usually get their profits on the same day.